No bridal look is ever complete without the right accessories. But picking the right accessories is no easy task either! Looking to sort out your embellishments? Follow these comprehensive tips to complement your wedding gown in style. As a rule of thumb, gold accessories work well with ivory colored dresses while silver or platinum pieces are better suited for bright white gowns or ones with silver accents. Now if your wedding dress already has plenty of detailing, be it embroidery, beading or any other embellishment, then your best bet would be to take cues from the shape, color and material of these existing ornaments when picking your bridal accessories. This being said, you can experiment with more original options with close guidance from our styling experts. No matter how much you trust your fashion instinct, your big day is by no means a suitable occasion to risk a major fashion faux pas! You must consider the neckline on your bridal dress when choosing your bridal accessories. Different necklines call for markedly different ornamental measures! And while there is no magic formula here, a V-neck dress generally calls for the most accessorizing, and can ideally be paired with an elegant pendant or even layered strands, depending on the décolletage. An off-the-shoulder neckline, on the other hand, can accommodate a statement choker. When it comes to strapless dresses, however, many experts recommend trading the necklace for statement earrings. You may also forgo necklaces altogether when wearing a high-neck or a single-shoulder gown and maybe save the spark for your hairdo instead. It is always great to have a look at the latest trends and consult with other fashion experts when picking your accessories. However, you wouldn’t want to end up with an arrangement that is completely different from your personal style. At the end of the day, your ultimate aim is to look like the best version of yourself on your wedding day as opposed to putting on an uncomfortable bride costume just because someone thought it suits you better. Veils come in a variety of lengths and designs, and choosing the perfect one can be quite daunting. However, you should always refer back to your bridal consultant to help you choose the perfect one. She will help you choose the veil that best complements the dress, since it all depends on the style of the bridal gown. For example, if your bridal dress has a long train and has a lot going on in that area, then it’s probably best to opt for a veil that won’t cover up that back beauty. Shorter veils are more versatile in the sense that they could work well for just any shape thanks to their face-framing quality, all while adding a hint of retro flair to your overall wedding look. You may also forgo the veil altogether and go for an elegant headpiece instead. Regardless of what accessories you end up with, it is important to create an aesthetically pleasant visual balance between the elements you choose to incorporate into your look. Do not be afraid to sport a bold accessory, but bear in mind that nothing should steal the spotlight from your wedding dress, which should remain the single focal point of your outfit. 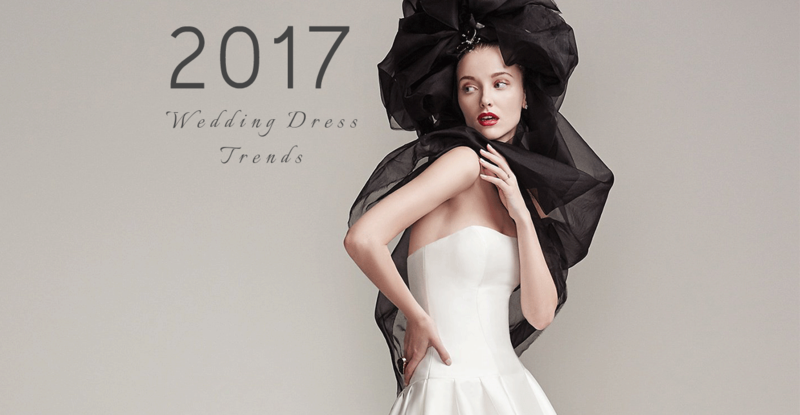 Here's a compilation of some wedding dress trends we love!